Borinquen The original Borinquen (it’s one of three) is also the busiest. Local Puerto Ricans and Rican food lovers alike populate this authentic spot from the time the first café con leche is slurped down to the minute the last jibarito sandwich (steak between crispy pounded plantains) is consumed. Juicy, onion-flecked steak, garlic-smothered plantains, yellow rice with pigeon peas and seafood salads are found on most tables in the dining room. 1720 N California Ave (773-227-6038). El: Blue to Western. Bus: 52, 56, 72, 73. Average main course: $11. Café Central If you smell something delicious when you walk into this Puerto Rican diner, don’t bother trying to figure out what it is. It could be any number of the greasy-spoon comfort foods that are dished up here daily: chunky, tomato-heavy goat stew or garlicky mofongo (a savory plantain fritter). 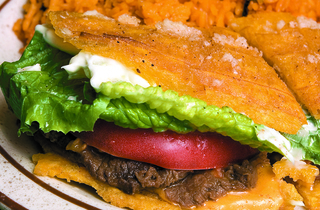 Then again, it could be the oniony jibaro (dubbed “hee-ba-roe” on the English menu), a gooey cheese-steak-like sandwich that substitutes plantains for bread. So take a seat—looks as if you’ve got some research to do. 1437 W Chicago Ave (312-243-6776). El: Blue to Chicago. Bus: 9, 66. Average main course: $9. Café Colao There are several things you can count on at this Puerto Rican café: hefty pressed sandwiches with copious amounts of roast pork; strong espresso and café con leche; delicious pastries, such as a Danish stuffed with cream cheese and guava; and a multigenerational clientele that comes in to discuss the merits of the aforementioned offerings (and everything and anything else). 2638 W Division St (773-276-1780). Bus: 49, 52, 70. Average main course: $7. Coco This sleek, boisterous Puerto Rican spot reminds us of the kind of place you’d find in San Juan. The modern art, hardwood floors and 1920s bar make an ideal setting for updated classics such as lomo de cerdo (pork chop in mango-rum sauce) and escudo boricua (lamb chops in papaya sauce). Strong mojitos may fool you into thinking you can move like the locals who pour in once the band starts around 10pm on Saturdays. But trust us—you can’t. 2723 W Division St (773-384-4811). Bus: 49, 52, 70. Average main course: $18. La Cocina de Galarza The family that runs this comfortable restaurant may assume that gringos wandering in are looking for Mexican food (and they’ll cook it for you), but authentic Puerto Rican specialties are the way to go. The belly-busting guachitos is a delicious off-menu request that combines fried plantain with salchichón (salami-like sausage) and fresh guacamole. The mofongo is easily as good as what we’ve had on the island. If more exotic dishes like braised baby goat sound too risky, the tender carne guisada (beef stew) is just as tasty. 2420 W Fullerton Ave (773-235-7377). El: Blue to California. Bus: 49, 52, 74. Average main course: $9. 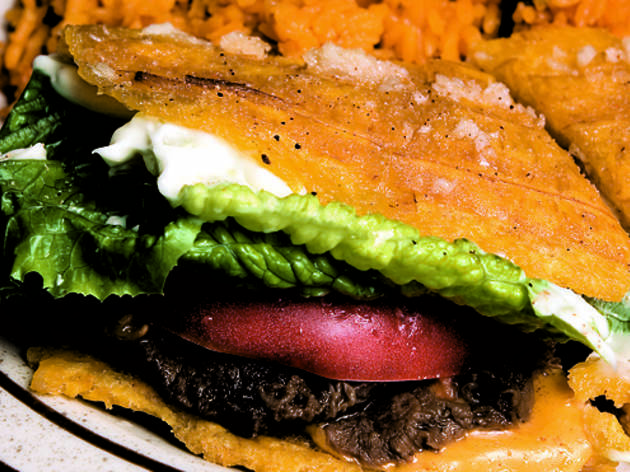 Sabor Latino Use this casual little stalwart as your entry point into Puerto Rican food. Try a mofongo to start, move on to a jibarito, and end with the sautéed steak with onions and a side of pork-flecked beans and rice. Helpful photos of dishes line one wall (soups taste better than they look), and the English-speaking counter staff is good with guidance. 3810 W North Ave (773-227-5254). Bus: 53, 65, 72. Average main course: $7.